← Angels and Demons and Hail…Oh MY! 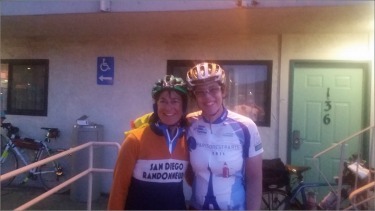 I left my room at the Motel 6, the official hotel of all things randonneuring, at 4:40am. 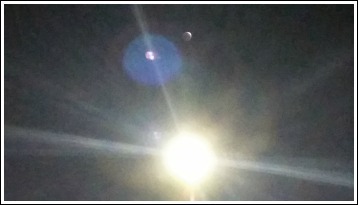 The morning was clear and not too cold, and the full moon overhead was glowing blood red as it approached a total eclipse. There were 35 of us greeting friends from near and far as the shadow of earth crept the rest of the way across Luna’s face and the ride organizer gave us his final tips about the route ahead. Michele had flown in from Minnesota again, and I recognized Hector and Keith from San Diego, Stacy and Greg from Orange County, Pete from Los Angeles. There were three intrepid men with Elipti-gos who stood out like dolphins in a sea full of leopard sharks. 5:00am, and we were off in a clatter of cleats and carbon cycling shoes, Garmins beeping the start of another day on the bike. We headed southeast on the Santa Ana River bike path, flying through the darkness as riders jockeyed for position. It wasn’t long before Michele and I fell off the back of the pack, neither of us inclined to start the morning at breakneck speed. 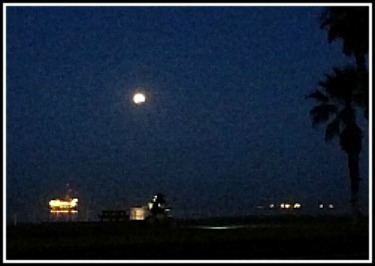 Instead, we gawked at the moon as we pedaled comfortably, watching its pearly splendor restored as earth’s shadow gradually passed. Sunrise found us at the Bolsa Chica Wetlands where hundreds of birds signaled their waking with a thousand squawks and caws, wings flapping in the early morning light. The route took us up the coast to Seal Beach, northeast on the San Gabriel River bike path past backyard horses and roosters through Downey to Whittier, then west on the Rio Honda bike path through the graffiti-etched ghettos of Compton and East LA to the well-heeled tourist-laden Long Beach Harbor with its cruise ships and naval shipyards. 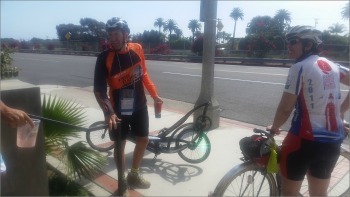 We passed through Belmont, glimpsing into cafes filled with hipsters enjoying cappuccinos on a glorious spring day, then back through Huntington Beach and Newport Beach before returning to the Motel 6 to refill water bottles and food for the next leg. I try to eat real food on these long rides, minimizing the use of anything with unfamiliar chemical ingredients and fancy packaging. Michele and I had spent the weeks before the ride electronically chatting about food for this adventure and sharing our experimental recipes. Shortbread made of quinoa flour and coconut oil was a dismal failure for both of us, her almond flour panalettes were an instant hit, and my empanadas filled with sautéed collard greens, kale, papitas, and feta tantalized our taste buds. She amused the TSA by making her carry-on a cooler full of rice cakes stuffed with raspberries, blueberries, sesame, and even bacon. Between us, we brought enough homemade food to feed half a dozen ravenous randonneurs. 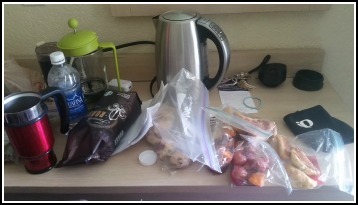 I was uncommonly hungry for the first 100 miles and found myself making the rounds of delicious morsels in my bag, eating nearly continuously. down, but passed up the deliciously scented Greek burgers in favor of the rice cakes we knew our stomachs would handle. We had been leap-frogging with Charlie Fournier from Redding all morning and he pulled in to the control in time to watch us stuffing the last of our ice down our sports bras, bemused to learn the girls’ secret to staying cooler as the mercury rose. 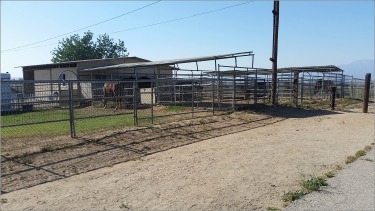 Charlie left the control with us, heading on through Corona and Norco, passing through a neighborhood where stables replaced garages and front-yard horses were the norm. We were briefly joined by Scott Cowen as we entered the Hidden Valley Park where the bike path is shared with hikers and equestrians. He passed us easily and disappeared into the horizon as we sailed up and down rolling hills through grasslands and picnic areas, dodging piles of horse excrement with alacrity as we moved ever eastwards and upwards through a corner of Riverside and into San Bernardino County. 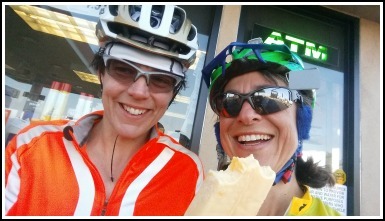 Michele and I enjoyed ice cream bars at the control, and parted ways with Charlie who wanted a longer break as we headed onwards through Loma Linda and Redlands. The biggest climb of the day took us out of Redlands heading southeast towards Beaumont. We passed by estate homes with orchards of blood oranges and avocados in their front yards, the air redolent with the sweetness of spring citrus blossoms. The light shifted from afternoon glare to golden to brilliant orange/red as the sun made its descent to the western horizon. It was nearly dark as we reached the summit, stopping to pull on leg warmers, wool jerseys, and reflective gear before continuing through a sea of rolling hills towards the apex of our ride. 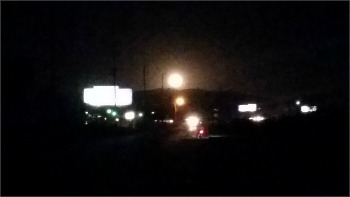 As we crested one hill, Luna gradually reappeared from behind the San Jacinto Range, hanging huge and brilliantly yellow to light our way over the final ascent to Beaumont. My head was starting to ache and I was fantasizing about a steaming mug of coffee at the control, but Michele convinced me to try some salt before committing to caffeinating. Headaches at the end of a hot day are almost always due to an imbalance in electrolytes and/or dehydration. For me, it is usually potassium which has dipped too low, but this time Michele was right on with her guess about sodium and I perked up instantly as the salt made it from my tongue to my bloodstream. Our stop in Beaumont was a quick one as we were eager to make the descent into Riverside for the legendary stew at the next control. Even with hats, full fingered gloves, and an extra layer of fleece we were shivering as we flew down Timoteo Canyon with the lights of Redlands spread out below us and the moon continuing to rise above. This is one of my favorite descents anywhere: a low traffic road with reasonable shoulder, good pavement, and stunning views. Michele was nearing her natural bedtime and had a mild case of the sleepies which she fixed with some caffeine on the way down. We were among the last riders to arrive at the control at the home of Ruth and Kevin Cabon, and the ratatouille was sadly gone. I had a small bowl of lentils and sausage, wolfed down two oranges and a cup of coffee, and we took off into the night. I’ve never had a sleep stop on a 600 kilometer ride, and Michele was on a mission to make sure this would be my first. We missed a turn passing through Riverside, and it took a few extra minutes to figure out where we went wrong and get ourselves back on course with the passage through UC Riverside. John Guzik from San Francisco caught up to us as we approached the tree-lined Victoria Avenue. He was having stomach issues and feeling awful, so conversation was minimal as we sauntered past sprawling estates across from strawberry fields, a stop-sign at every intersection making for slow going in the middle of the night. Finally we made it back to Corona, making a quick stop at the control before returning to the Santa Ana River bike path for the final 20 miles of this leg. The batteries in my light were fading as we approached the path and we made another quick stop to fix the situation as John passed us and kept going, a man on a mission to get back and rest. Another mile up the trail and my light went out as I came over a bump. It refused to turn back on, and I had a moment of concern that I would be replaying last year and limping in by the sadly impotent beam of my back-up light. Thankfully, Michele has gone through more lights than I and her back-up was considerably superior to mine. It took a few minutes to install her light on my bike, but it was worth it for me to be able see the road well enough to ride at “normal” speed for the rest of the night. We rode along chatting about random things, listening to the primal calls of night birds seeking dinner and dodging bunnies that darted across the trail as we passed. It was 3:40am when we pulled into the hotel, got our brevet cards signed, and headed to our room. On my first 600k I slept for 15 minutes propped up on the side of a convenience store after a cup of coffee at 2:00am. On my second, I was so late getting to the sleep stop that I was only able to afford 45 minutes sprawled on an air mattress in all of my layers. This time, I had the luxury of stripping out of my sweaty shorts, rinsing the salt from my nether regions, and sleeping for two whole hours in my pajamas in a real bed. I woke up to freshly brewed coffee from a French press, clean shorts, and a solid breakfast, passing the zombie hours with a nap and stepping out at 7am to a new day. The route took us southeast along the Santa Ana River bike path, back to Newport Beach and down the coast. We rode the bike path through Crystal Cove State Park. I’d ridden past this hundreds of times and never knew the bike path was there. It was short and scenic, meandering along rolling hills overlooking the pacific. As we descended towards the cove, I caught a glimpse of a dark shape and dorsal fin in a wave about 5 feet from the shore. I never got a clear look to tell if it was a dolphin or shark which was enjoying the shallow water. We continued down the Pacific Highway, passing church-goers in Easter finery and early morning coffee drinkers strolling the sidewalks. A dog sporting bunny ears caught my eye and we greeted its people with “Happy Easter” as we kept going. An open control in Dana Point allowed us to stop at a grocery store and indulge our craving for avocados. Michele had gifted me with a shiny new spork, and I put it to good use carving out the creamy fruit and sprinkling it with salt before each bite. 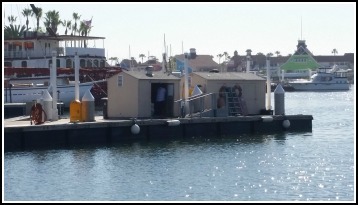 Charlie caught up with us again, and we greeted him as we pulled out to continue our southbound journey to Oceanside. guacamole and well salted chips one of the Elipti-go riders pulled up and two other riders passed by, waving as they went. Michele asked if she could take a photo of the Elipti-go, and the rider noted he was on a 375 mile ride and had a total of 40 hours to do it. She laughed and noted she was on the same ride. He grabbed a large soda and left with us, gradually becoming more lucid as the sugar hit his blood stream. He was Jim Cremer from Iowa, and was recovering from an unfortunate bout with the stomach flu which had ravished his family the previous week. He looked remarkably good for someone 320 miles into a ride where queasiness had made eating an exercise in uncertainty, and we were less concerned about his ability to finish than he was. 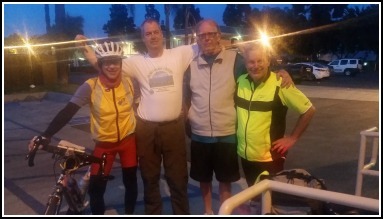 We caught up with the other riders as we passed through San Juan Capistrano, a good thing since Nick Matyas was a local and the route around the train station was a bit confusing. He was riding with Pete Eads from Los Angeles, a pleasant gentleman originally from New Zealand who had been trying to complete a 600k for several years. I remembered Pete from last year when we rode together through Norco before he dropped back unable to keep my pace. He had made it to the 400k point and stopped, but this year he was still going and looking strong with less than 30 miles to go. Charlie caught up to us as well. 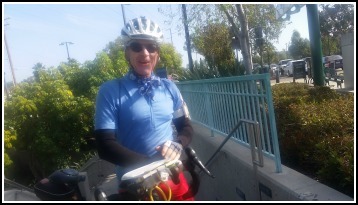 His GPS had sent him in circles through Dana Point, and he was relieved to have gotten back on track and found other riders. We passed through San Juan Capistrano in a group, regaling each other with stories from rides past as we rode. an official time of 38 hours 16 minutes, my fastest 600k ever. A few minutes later, the next riders pulled in. John and Yogy, who had briefly caught up to us on the final stretch of bike path and fallen back when we picked up the pace. Another 15 minutes and in came Nick and Pete, exuberant in his successful finish. Photos were taken, the mood buoyant as we congratulated each other on a job well done. I’m usually one of the last riders in, greeted by a tired ride organizer who is eager to be done at the end of the day, and it was beyond exciting to be in the middle of the pack at the finish sharing the experience with other riders as they too accomplished their goals. By the time Michele and I had showered, Charlie had made it in and we were there when the final rider arrived. The lantern rouge belonged to Scott who completed his first 600k and finished alone, tired but still lucid and high on the accomplishment. I’ve now ridden 3 “official” 600 kilometer rides, and one which was intended to be longer and ended up at 600 kilometers. Every ride of this magnitude has its challenges and its highlights. This was the first time I went into a ride of this distance quite certain that the ride would not kill me and looking forward to it without trepidation. Instead of approaching it as “600k”, I looked at it as 400k plus 200k. This let me plan a real sleep stop and mentally break the ride into two chunks with a logical break. Michele once again proved to be an outstanding and fun partner. We were together for the entire ride, pacing each other perfectly. There were brief periods when one or the other of us was stronger, but overall our styles and paces matched as if we were made to ride together. The scenery and conversation kept both of us going, and we managed to keep up with calories and electrolytes surprisingly well through weather which ranged from hot and dry on Saturday to cool and damp on Sunday. While I’ve met people on other long rides, this time I was relaxed enough that I could really pay attention to their stories so Charlie and Pete and Nick and Jim became integral parts of the experience rather than minor characters on the periphery. It was a profound honor to be part of Pete’s success after so many attempts at completing a 600k, and fun to trade stories and share the road with Charlie, Nick, John, Jim, and Scott. Epilogue: Many thanks to Terry Hutt for his outstanding cue sheets and unwavering support to 35 riders over 40 hours. It was a pleasure to share our victory dinner with you. Thanks also to Ruth and Kevin for your hospitality and hot food. Your home is a beacon of light at the end of a cold descent in the middle of the night. Pete Eads, you have my sincere congratulations for a job well done. Your steadfast determination to keep on coming back until you finally make it is something to be admired. To my bike angel, I hope you enjoyed your weekend off. I have no doubt that I’ll need you again, so I hope you are well rested and up to the task. And to Michele, I’m still blown away that you’ve been excited to fly halfway across the country to finish not just one ride but an entire SR series with me. I couldn’t ask for a better partner and can’t wait to ride with you again in Wisconsin and Paris! Congrats, glad this one went so well, you are amazing. Always a great experience to ride with you and then even read about it afterwards!